When I was little, my dad had a health scare and needed to eat more low-fat and low-cholesterol food. He also went on big cooking/baking sprees when I was a kid, leaving the kitchen a disaster zone, much to my mother’s dismay. His cooking endeavours frequently involved the Looneyspoons cookbook (1996) by Janet and Greta Podleski, which features low-fat Mexican food with fun names and silly descriptions—my dad to a T.
When I started craving enchiladas a few months ago, I knew that it was my dad’s Looneyspoons recipe I wanted, but being a vegetarian now changed things. 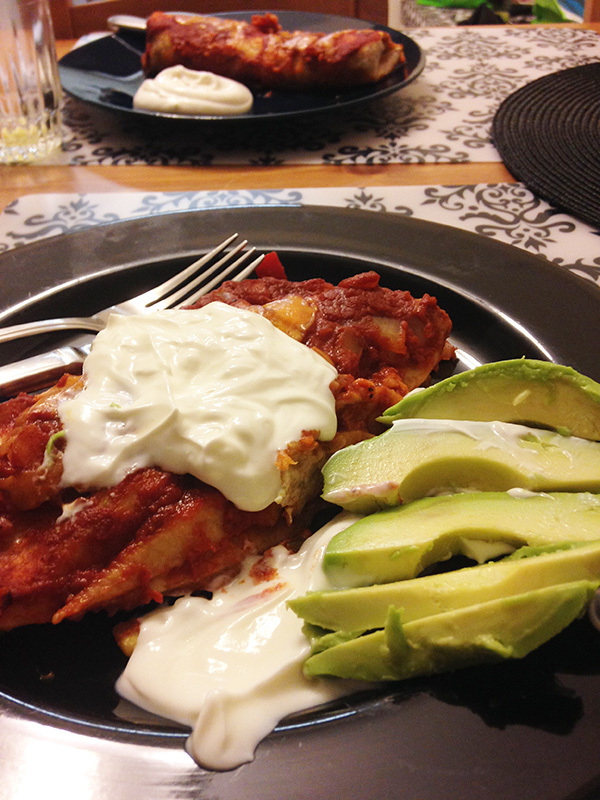 I became a vegetarian when I was 13, so I’d already been enjoying my dad’s chicken enchiladas for a few years. Add in the additional fact that my boyfriend is not a vegetarian and doesn’t like black beans. So I was hoping to find a recipe similar to what I craved that also didn’t double my work to make a vegetarian and a meat version. So, I’ve reworked the recipe to be easily split into two, one with meat and one vegetarian. This would also work if someone was allergic to an ingredient, like corn, or didn’t like black beans (ahem). These instructions make 10 in total, 5 vegetarian and 5 chicken. The sauce is vegetarian-friendly and I recommend serving with sour cream. We bake them in 2 different pans (obviously) and there is very little difference in cooking time because the chicken is pre-cooked. First, you make the sauce and the filling. Once sauce is done, it can be set aside to cool or used while still warm. If you want to prep everything beforehand, complete all the sauce & filling steps but do not assemble until you’re ready to bake it. This prevents the tortillas from getting soggy. 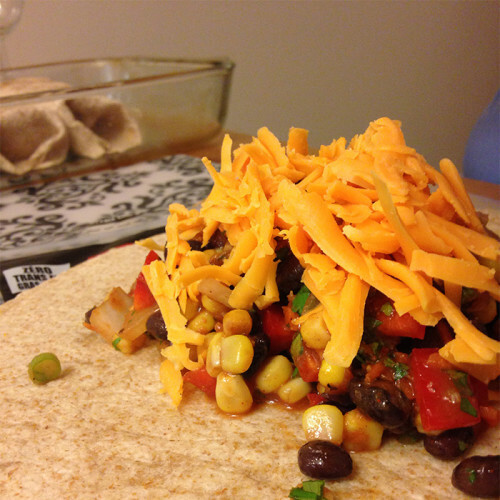 The filling and cheese is rolled inside the tortilla and then placed in the casserole dish. 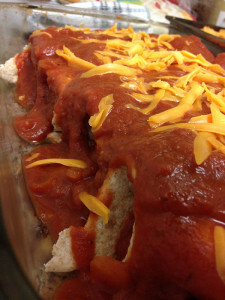 Then the enchiladas are smothered in sauce and more cheese and baked. Preheat oven to 375°F. Grease two oven-safe casserole dishes (I use non-stick cooking spray). Chop onions and garlic. Heat olive oil in large saucepan, medium heat, and saute until onions begin to soften (2-3 minutes). Set aside ½ cup of mixture. Add spices, and stir to coat onion mixture fully. Add crushed tomatoes and stock (or diced tomatoes). Bring sauce to a slow boil, reduce heat and simmer for 15 minutes. I usually taste the sauce at this point and add more spices if necessary. Prepare 2 bowls, 1 for meat, 1 for vegetarian. Add the chicken to the meat bowl only. Add half the onion mixture (set aside from sauce) to each bowl. Add remaining filling ingredients divided between the two separate bowls so they create roughly the same amount of filling. This usually means putting more of the filling ingredients in the vegetarian bowl to even it out. Add spices, mix well, and set aside. 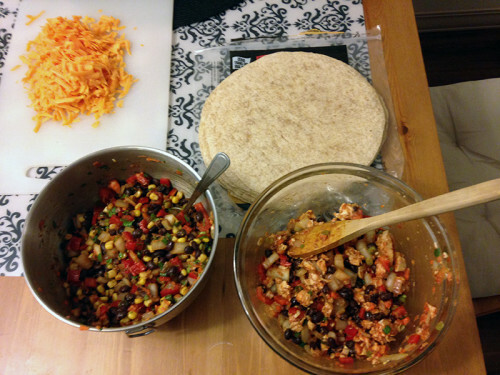 Add a large ladle-full of sauce (approximately ½ cup) to each bowl of filling. Mix well. Set aside half the cheese (approximately 2 cups for each bowl). 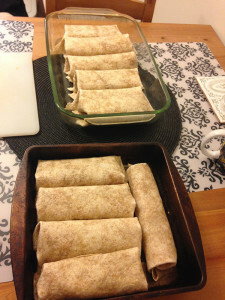 The tortillas will roll best when they are warm, but if you heat them too much they become brittle when they cool down. I usually wrap them in a damp towel and tin foil, then put them on a cookie sheet in the oven for 10-15 minutes. But in a pinch you could also warm 2-3 tortillas at a time in the microwave, separated by dry paper towels. 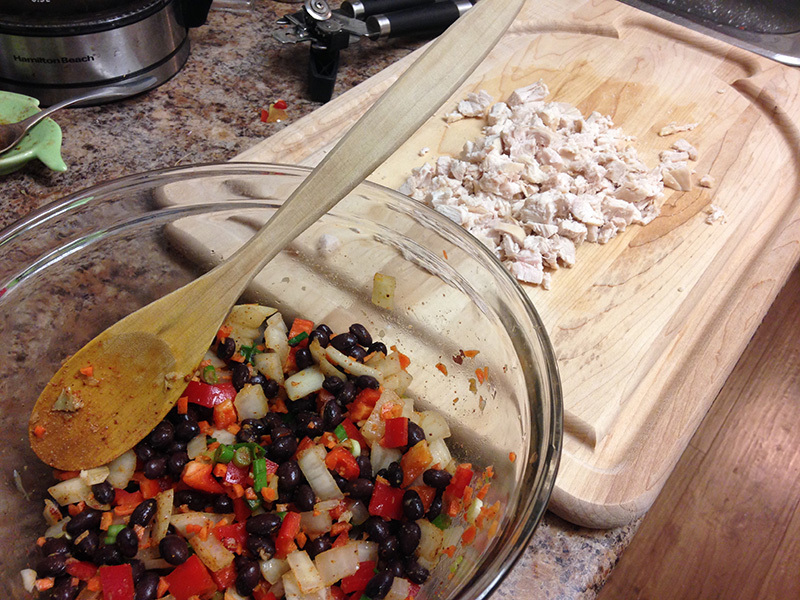 Working one at a time, spread a heaping spoonful of the filling (approximately ⅓ cup) in centre of tortilla. Top with ⅕th of the cheese. Roll up tightly and place seam-side down in baking dish, one dish for vegetarian and one dish for meat. Repeat with remaining tortillas, filling and cheese—there should be 5 meat and 5 vegetarian enchiladas. Each dish will hold 5 enchiladas. Spoon sauce evenly over enchiladas, making sure each enchilada is covered with sauce. Top with remaining cheese. Uncover and bake an additional 5 to 10 minutes, until cheese is bubbly. Serve enchiladas hot with a dollop of sour cream and a sprinkle of green onions or avocado on top.